Japan Centre has teamed up with Third Window Films again, this time to give you guys a chance of winning a DVD with three superb films from contemporary Japanese Director Miki Satoshi. This limited edition box set has been specially created to coincide with the UK release of his quirky comedy ‘Adrift in Tokyo’. The ‘Miki Satoshi Collection’ set includes 3 of his hit best titles: ‘Turtles are Surprisingly Fast Swimmers’, ‘Instant Swamp’ and ‘Adrift in Tokyo’. All three are going straight to DVD and won’t be available to see at UK cinemas, so this is a great opportunity to see some fun Japanese films. Fumiya is a student with no friends or family, leading a lazy lifestyle. What’s more, debt collector Fukuhara is on his case. Fumiya owes 800,000 yen to loan sharks that he can’t repay. Fukuhara makes a proposition – he will cancel the debt if Fumiya walks with him across Tokyo to police headquarters in Kasumigaseki, where he intends to turn himself in for a crime he deeply regrets. On first glance you might not think a story involving two men walking aimlessly on the streets of Tokyo was gripping stuff, but this subtle movie is a fascinating and humorous adventure that is sure to charm you. 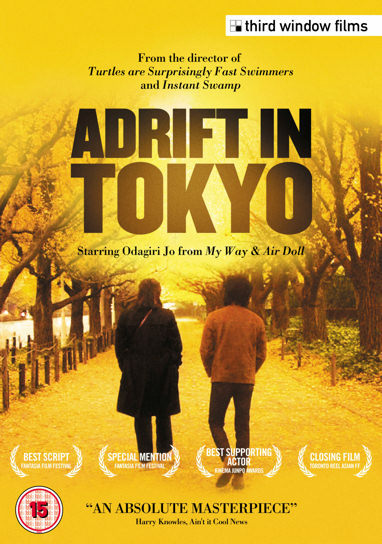 ‘Adrift in Tokyo‘ will be released on DVD in the UK on February 27th. If you want to know more about the movie you can ask Miki Satoshi directly, when he and his regular collaborator, actress Fuse Eri will be appearing at the Hyper Japan event this weekend to talk about their work in contemporary Japanese cinema! To enter and win this super cool box set, all you have to do is leave a comment or tweet telling us which Japanese movie character or star you would love to meet! Are you crazy about Kaneshiro or bonkers for Totoro? Let us know! Simply leave your answer in a comment on this post, or if you prefer you can head over to our Facebook page and leave a comment on the post there. You can even re-tweet your answer on Twitter! We will choose a random winner from everyone who leaves a comment and let you know whether you have been chosen by Friday, February 24th. Posted in Uncategorized and tagged competition, Films, hyper japan. Bookmark the permalink. It’s sad, but I want to meet Jinguji Ren from Uta no Prince-sama Maji Love 1000% because he plays the saxaphone like I *wish* I could play it, full of joy. My favorites actor is *Toshiro Mifune* in the movie “Mojimbo ” as “Senjuro “. Tabe Mikako for me. She has brilliant comic timing! I would love to meet anyone in the Woman in the Dunes; hopefully, there will be a remake??? Would definitely want to see the actors who would be brave enough to play the Woman and the Entomologist Niki Jimpei. Some days it’s Tadanobu Asano. But mostly Tsukamoto Shinya. Takeshi Kitano would be my choice. His performance in Battle Royale has everything, so funny, so menacing, so lost and confused. I would like to meet Tora-san from ” Otoko wa tsuraiyo.” He is always my favourite. It would have to be Beat Taneka – an inspiring performer and director! I would love to meet Ayako Wakao and ask her about all the interesting films she made with Yasuzo Masumura. Kōki Mitani. I’d like to know how he does the long camera shots. Kenichi Matsuyama. I like his somehow flimsy being. He has done far to many good movie !! Oh boy, let me be the lucky one! I want to meet Tampopo (Nobuko Miyamoto) from the movie ‘Tampopo’, so she cook for me and we could talk over a bowl of delicious noodles…. I want to meet Maki Nomiya all round amazing renaissance woman , ….supermodel,,,,,face of Japan and Voice of the Pizzicato Five . I’d like to meet Masaaki Sakai, I used to love his Monkey! series on UKTV in the 80s. I would love to meet Totoro and give him a big cuddle! I would love to meet Eita Nagayama who starred in summer time machine blues, which was an epic film! I would be humbled and honoured to meet the two men that have had an enormous (if not the biggest) influence on the Japanese film industry HAYAO MIYAZAKI and AKIRA KUROSAWA. Not only are their films pioneering the stories, the characters they have created are embedded in popular Japanese culture. Quite simply they are just creative geniuses. Takakura Ken… I know I’m too late! but I just loved his face! I would like to meet Daikichi Kawachi from the Usagi Drop film, (recently released on BD/DVD in Japan … needs to be translated and released here!). Toshiro Mifune would be a great person to meet, he has played a wonderful list of characters, my favourite is the Kagemusha! I’d love to meet Ryosuke Yamada – somehow he manages to be in Japanese TV dramas and has been included in a number of Johnny’s bands, like Hey! Say! JUMP and NYC Boys, at only 18 years old! That’s commitment. I’d like to meet Takeshi Kitano. I love him in Zatoichi and think he would make an interesting dinner companion! Takeshi’s Castle boggles the mind of many of us in the UK. I would love to meet the giant robot from Laputa Castle In The Sky. I would LOOOOOOVE to talk to rurouni Kenshin! I mean, who wouldn’t? Don’t forget ‘Adrift in Tokyo’ will be coming out on the 27th of Feb. If you want to catch any other Miki Satoshi movies before then or see the man himself, Third Window Media and Miki Satoshi (and Eri Fuse!) will be hosting a film show case at Hyper Japan http://hyperjapan.co.uk/ this weekend! Totoro – my first introduction to Studio Ghibli and then other Japanese films! I would love to meet Chihiro from Spirited Away – my first Japanese film I watched! I know the competition is now closed, but I like this question, so I’m still going to answer! Would love to meet: a LOT of the Studio Ghibli characters. Probably all, but especially: Howl. Haku. Princess Mononoke. Ashitaka (and the kodomo!). Matsujun’s Hayakawa Vito from the dorama 「スマイル」 (Smile), just because I’d want to give him a big ol’ hug! And I would want to meet Matasaburō! (from the book and the film Kaze no Matasaburō). That’s one story I’d like Studio Ghibli (or Katabuchi Sunao or, maybe, Shinkai Makoto) to turn into an animated film! I would love to meet Setsuko from ‘Grave of the Fireflies’ to give her a cuddle and all the bento she’d ever want.